Is Higher Ed Technology Keeping Up with Student Demand? Students see campus technology is a key factor in selecting a college or university and consider it critical for their professional development. Yet higher education institutions on the whole aren't keeping up with student needs in this area, according to a new report released Monday by CDW Government (CDW-G). The report--The 21st-Century Campus: Are We There Yet?--highlights several areas in which campuses seem to be deficient on the technology front, including support for digital media (such as podcasts), support for Web 2.0 tools (like social networking, wikis, etc. ), off campus network access, and laptop programs. Community colleges lead the pack in support for podcasts; public colleges and universities lead in support of off campus network access, 1:1 laptop programs, and support for Web conferencing; and private institutions lead in the areas of Web 2.0 adoption. "While students are incorporating technology into nearly all aspects of their higher education experience through laptops, the Internet, social networking sites and online course management, the on-campus technology experience is not keeping pace," said Julie Smith, director of higher education for CDW-G, in a statement released to coincide with the report. "We do see, however, that colleges and universities recognize campus technology can offer a distinctive competitive advantage as they seek to recruit and enroll the best and the brightest students. As a result, institutions are making campus technology upgrades and integration into the educational experience a priority." According to the report, students hold strong opinions about the need for technology access in higher education, both for their academic careers and their lives outside of the classroom. When asked whether how important technology was in choosing a school, high percentages of students indicated that it was "important" or "very important," particularly those in vocational and technical studies (90 percent), communications majors (89 percent), engineering majors (79 percent), business majors (78 percent), and education majors (73 percent). A full 63 percent of students reported that they use technology every day to prepare for class, while only 24 percent reported that they use it every day in class. Seventy-five percent use laptops; 60 percent use social networking sites, such as Facebook, MySpace, and Twitter; and 58 percent use iPods or MP3 players of some kind. 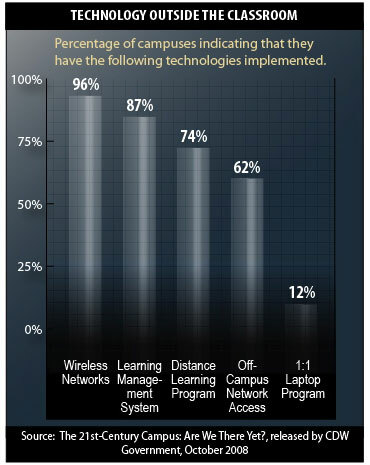 And while most campuses are good at providing some forms of technology for use by students--such as wireless connectivity on campus, which 96 percent of campuses do offer--there's still a gap on the software side. For example, only 23 percent of campuses offer chat with professors, and this was the No. 1 desired tech capability among students surveyed for the report (39 percent). A respectable 87 percent of campuses offer course management systems, and 74 percent offer some form of distance learning. But only 62 percent report offering off campus network access; only 44 percent provide computer labs at which students report they "can always get a seat"; and only 12 percent offer 1:1 laptop programs. Further, 88 percent of faculty reported that they're encouraged to use technology in their classes, and 91 percent said they believe technology is critical to the success of the courses they teach, but only 33 percent reported that technology is fully integrated into their campuses. That said, 81 percent of faculty members did indicate that they teach at least sometimes in classrooms equipped with technology, such as projectors and whiteboards, but, of those, only 43 percent indicated that they use these technologies during every class. Meanwhile, other professors must be bringing their own technologies onto campus for use in teaching because 28 percent of those who do not teach in a technology-equipped classroom ever nevertheless do use technology during every class, according to the survey. Some disconnects did show up in the report among faculty, IT staff, and student technology perspectives. For example, while 17 percent of IT staff reported that classrooms are not outfitted with technology, nearly twice as many students--31 percent--said their classrooms were not outfitted. There was also something of a disconnect in the perception of the value of technology. A full 17 percent of students said technology is not useful to their studies; this contrasts with 2 percent of faculty and 0 percent of IT staff members. When students were asked which technologies they would recommend for their instructors, the responses included digital media, such as online videos, podcasts, live streaming, and slideshows, and wikis. 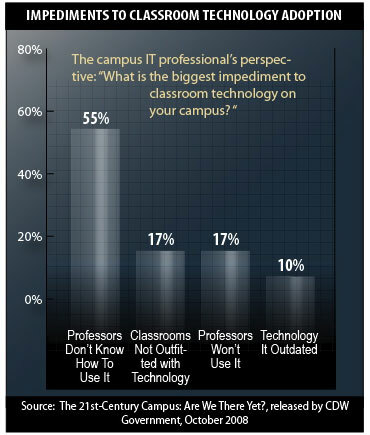 Faculty members, when asked what they would like to be able to do with technology that they currently cannot, responded that they wanted smart classroom technologies, better integration of audio and video into presentations, access to more interactive technologies, and greater reliability of the technologies available. IT staff members were asked what single piece of technology they wish their campus offered. Responses included 1:1 laptop programs, audio/video conferencing; standard equipment in all classrooms; identity theft protection technologies; and "middleware to tie together all the services available for students and faculty." The technology trends IT staff members said they're currently watching included Web 2.0, virtualization, distance learning, and business continuity planning, among others. Leveraging Web 2.0 technologies "to connect students and faculty" and "build community within and beyond the campus." It also recommended conducting annual technology assessments. As part of the report, an index has been developed to help with such assessments and let IT staff determine where campuses fall compared with the national average in terms of technology integration. The national average is 46.08 out of 100, indicating that colleges and universities on the whole are about halfway there in terms of meeting student and faculty technology needs. Those wishing to compare their own institutions with the national average can do so through an online form here. Completing the questionnaire also provides access to CDW-G's complete report.